Fireman Albert Joseph Nicholls "Bert"
Albert Joseph Nicholls was born about 1874 in Mile End, now in Greater London, but then, it was known as Mile End Old Town and formed part of Middlesex. He was the son of Joseph and Jane Nicholls. Bert's siblings included James Edward Harold Nicholls, Alice Louise Wager Nicholls (married Edwin William Bellman), Elizabeth Jane Wager Nicholls, Gertrude J. Nicholls, Walter John Nicholls, Earnest Victor Nicholls ( married Ethel F Campion) and Ethel Esther May Nicholls (married Alfred John Yates) . Albert married on 15th May 1898 in Christ Church, Camberwell, just south of the River Thames. His bride was Mary Rebecca Dawson, daughter of William James Dawson. They would have two children, Dorothy Alice and Horace Albert. Bert worked in the Chatham Dockyard as an analyist in the laboratory. He was a member of the Ancient Order of foresters and had been District chief Ranger of the Rochester and Medway district. Albert and Mary's son Horace Albert Wager Nicholls was born about 1900-he joined the Royal Navy, Service No: M/9973, but tragically became a victim of the Great War on 9th April 1917 at the age of just 17. He served as a Boy/Shipwright on H.M.S. "Pembroke" and was buried in the Naval Reservation at Gillingham, plot 24. 1249. Their daughter Dorothy Alice married William Bowring and was living in Germany at the time of her father's death. Dorothy passed away in 1962 in Weymouth Dorset. At the time of the disaster Bert and Mary were living at 69 Napier Rd., Gillingham. Bert had been a member of the Fire Brigade for twelve years and had taken part in many similar demonstrations. His part was to stay in the building until almost the last and arrange the life-saving. His wife Mary objected to these demonstrations therefore did not attend the fete that fateful night. Burt's body was burnt beyond recognition. Identification was finally made by the Mayor, Councillor Treacher. Mr. Treacher was also a professional dentist and was able to identify Burt through his dentures. News reports said Fireman Nicholls was the first to jump from the building but the Cheif of the Brigade said his body was found on the third floor where he died at his post. Mary would pass away in 1938, she was still living in their home at 69 Napier Road at the time of her death. Earnest Cosey Read, a member of the Fire Brigade, identified Bert's body at the inquest. Mary would remain living in their home until her death on May 15th 1938. She was 78 when she died. Bert's coffin was carried to the cemetery on a fire engine. He was buried beside his son Horace Albert Wagner Nicholls. In 1938 Mary was buried along with her son and husband. 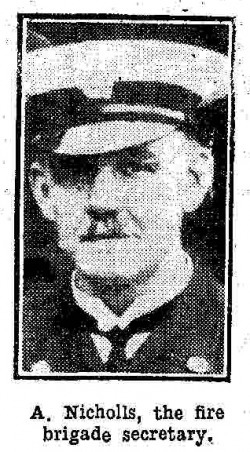 He was Gillingham's Chief Fire Officer in 1929 and present at the tragedy. He attempted to enter the burning building and also attempted to climb an escape ladder which crumbled beneath him. He was in charge of the demonstration that evening. He was present at the funeral and testified at the inquest. was the First Lieutenant in 1929. He had supervised the building of the "house". He was also a carpenter with the Gillingham Corporation. He was present at the tragedy and attempted to rescue the occupants. He was also present at the funeral and testified at the inquest. It was A. Daniel's son , Cyril Daniel who identified the firemen in this photo. Cyril Daniel was a motor man employed by Gillingham Corporation and was also a Fireman. He was present at the tragedy and his hands were badly burnt that night. There was also a "Station Engineer Daniel present. Its not clear to me if this was A Daniel or not but likely was. Cyril testified at the inquest. Both Albert Nicholls and his wife Mary are buried with their son in his war grave, neither internment is recorded on the marker. Fireman's Nicholls grave on July 10th 2011 with flowers placed by the Kent Fire and Rescue Services, North Kent Group during the Commemoration service that day.